Iron Maiden will release a new live set this spring. “EN VIVO!" was filmed on April 10, 2011 in front of over 50,000 ecstatic fans at the Estadio Nacional, Santiago during the Round The World In 66 Days leg of The Final Frontier World Tour. Due March 26 (March 27 in North America), the package captures a magnificent performance by the band, ardently embraced by the legendary Latino passion and energy of their Chilean fans. With spectacular stage backdrops, dynamic musicianship and a literally jaw-dropping appearance by Eddie, this live show encapsulates to perfection the heart and soul of Iron Maiden 2011. “This show also features the gigantic new Eddie,” Harris continues. “He wasn't due to make his appearance until our European leg of the tour later in 2011, but we managed to transport him across the sea in a special huge container just in time for the latter end of the South American dates so it was great we were able to immortalize him for the DVD as he really has to be seen to be believed!" The concert was filmed digitally using 22 HD cameras and an octocam (a flying camera which captures aerial crowd scenes), recorded in both stereo and 5.1 audio and mixed by Maiden's longstanding producer Kevin "Caveman" Shirley. DVD Disc Two is a Bonus Disc containing an 88-minute documentary, BEHIND THE BEAST. 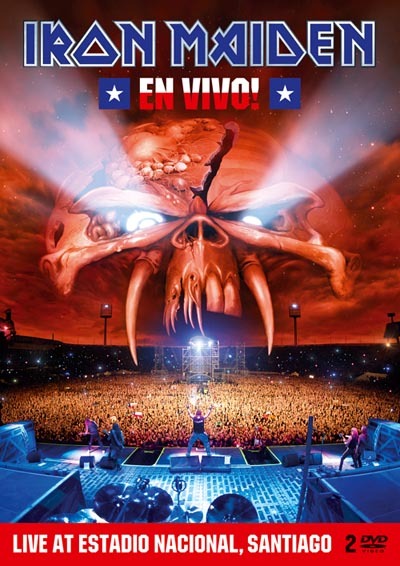 This is also an entirely in-house production by Maiden's own Krew, led by Andy Matthews, and is intended as an interesting and revealing high quality "home movie" for their fans of how to put on an Iron Maiden tour and what goes on behind the scenes at a show. The bonus disc also contains an extended version of the promo video "Satellite 15...The Final Frontier", a video about the making of "Satellite 15...The Final Frontier" plus the opening video sequence to The Final Frontier World Tour. In addition to the Blu-Ray, the 2DVD will initially be available as a Limited Edition double DVD in Collectors Steel book case and Double Vinyl Picture Disc. As well as a traditional 2CD Soundtrack album, EN VIVO! will also be available as a Digital Download, CD soundtrack album and Digital Download Video. Maiden's "Final Frontier World Tour 2010-11" saw the band circumnavigating the planet for the third time in their customized Boeing 757, Ed Force One, piloted by lead singer Bruce Dickinson, and playing 98 shows in 36 countries to over 2 million fans.